Mark Caprio, Ph.D., associate professor of theoretical physics, associate chair, and director of graduate studies, is the recipient of the 2017 Father James L. Shilts, C.S.C./Doris and Gene Leonard Teaching Award from the College of Science. The award, presented on May 19 at the College of Science Dean’s Awards luncheon, is given for excellence in undergraduate or graduate teaching and is the highest teaching honor bestowed by the college. This award, given annually to a faculty member in the College of Science, is named in honor of Father James Shilts, C.S.C., who taught in the Department of Physics from 1961 to 1982. The award was endowed in 1984 by Eugene T. Leonard III, a member of the Science Advisory Council from 1976 until 1991, in memory of his parents, Eugene and Doris Leonard. 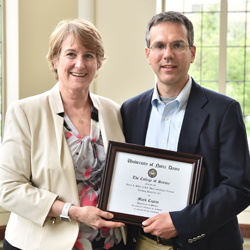 The award recognizes a faculty member who has demonstrated sustained excellence in teaching. Caprio graduated from Oglethorpe University in 1994 with a bachelor of science in physics and mathematics and earned master’s and doctorate degrees in physics from Yale University. Caprio received the Rev. Edmund P. Joyce, C.S.C., Award for Excellence in Undergraduate Teaching in 2014. Originally published by Grant Johnson and Tammi Freehling at science.nd.edu on May 26, 2017.